One of the many ways WordPress (the home of On the Sunnyside) makes blogging fun is with a weekly challenge. There is one for writing as well as photography. These challenges are a great way to inspire bloggers to work on improving their skills. This week, the photo challenge is to take and submit a picture of a silhouette. As I pondered the challenge, the first thing that came to my mind was Two Silhouettes on a Shade. There is a song for every occasion! However, a song is not a picture, so I had to move on. My photo? Actual stick-in-the-ground-where-needed silhouettes of dogs. 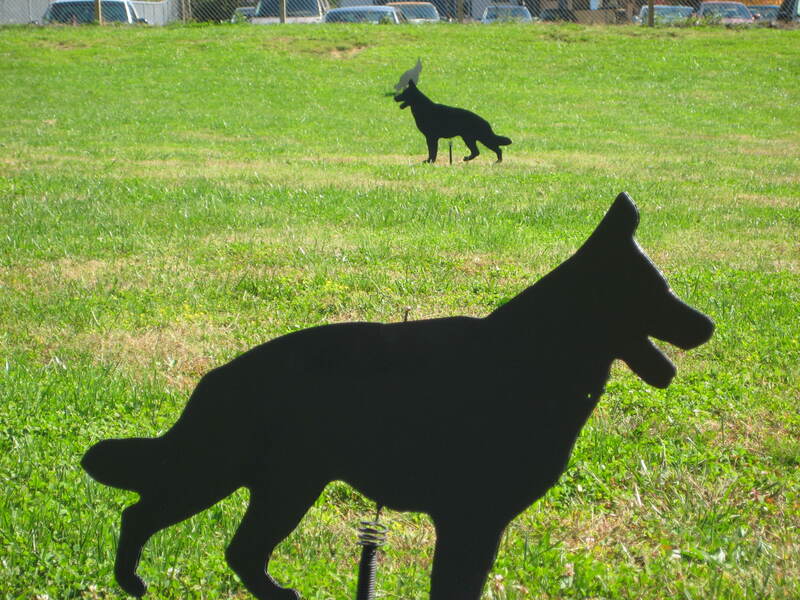 These have gained popularity in our area as a way to keep the Canadian geese off the property. I certainly believe the South is a great place to live, but we have enough geese here year round to solve world hunger (if we were allowed to make them available for consumption). Geese make a gross mess wherever they hang out, hence the effort to keep them from landing in the first place. Maybe the dog silhouette is something to consider if you have your own goose problem.